The liability of a pedestrian – bicycle accident in Maryland works in the same way as with any other type of accident. The pure comparative negligence rules state that each party involved in the crash between a pedestrian and a bicyclist will have a certain amount of fault assessed, and the right to recovery lowered accordingly. If you have been involved in a bicycle accident, you should contact a personal injury lawyer from Maryland to help you prove your innocence and the liability of the other party. In a bicycle accident in Maryland with a pedestrian, each individual is considered equally liable at first for the crash. As a result, each of the parties needs to present evidence to prove the other was more at fault for the collision than the other. Even if you suffered a pedestrian injury in Maryland, according to the traffic law in MD, you still have to bring forth evidence against the other person involved in your accident. With the help of an Annapolis injury lawyer, you will be able to gather the evidence needed to prove the liability of the other party. Pedestrians are obligated to use sidewalks when those exist and obey all traffic signals. According to the traffic law in MD, if you were lawfully on the sidewalk or a crosswalk when the cyclist hit you, it is possible to claim that the bicyclist was negligent and entered the area where you were lawfully walking. 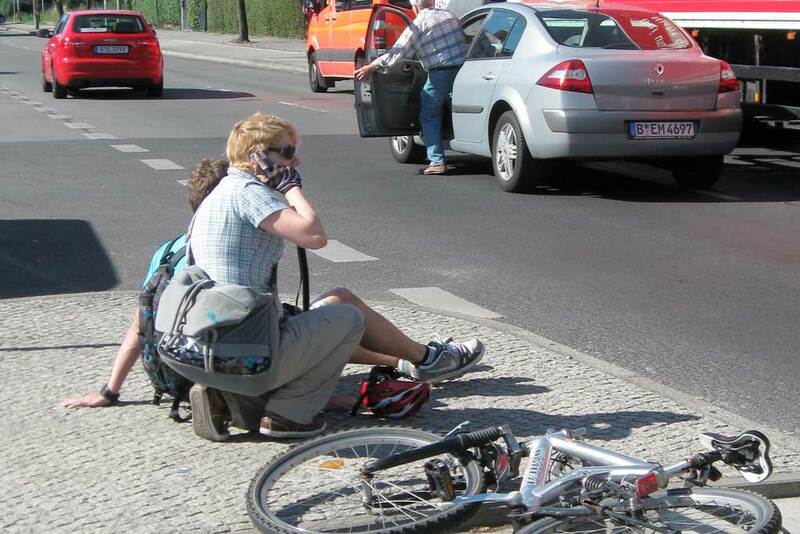 To prove the liability of a bicyclist, you have to show that their behavior was negligent and caused the accident. For example, if you can prove the cyclist was distracted from the path in front (such as the result of texting), you could claim that the bicyclist neglected to watch where they were going and struck you as a result. With the help of an Annapolis injury attorney, you will be better represented in court for the case and with the vast experience, we possess you will avoid making any mistakes that will bring the liability on your side. It may seem impossible for a pedestrian to cause severe damage to a bicyclist, but it is not unheard of. For example, if a pedestrian steps out instantaneously into the path of a cyclist, there is almost no time to slow down and avoid the collision. To prove the liability of the pedestrian, the cyclist has to show that there was no way for them to stop in time and prevent the pedestrian injury in Maryland. By proving the negligence of the pedestrian (such as from using their cell phone while walking), you will not be held responsible for the accident. An Annapolis injury lawyer who knows the traffic law of MD will gather all the evidence needed to prove the pedestrian was at fault. It is important for both pedestrian and bicyclists to remain vigilant and focus on the path in front of them. If you were the victim of a pedestrian injury in Maryland, you should contact a personal injury lawyer from Maryland to prove that you were not at fault for the accident. Contact the best Annapolis injury attorney at (443) 569-3950 or at email [email protected].